Kristin's World: Tropical Forests = Carbon Source? 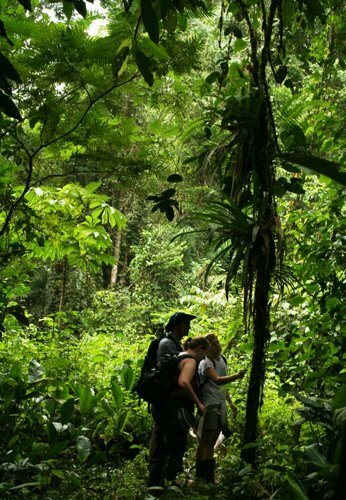 In the CO2-cycling machine planet Earth, tropical forests are on our side. Scientists have been telling us that climate change, caused by fossil fuel emissions, is mitigated by CO2 uptake of plants in the process of photosynthesis. But plants also emit CO2 in the process of respiration. Researchers at UC Davis recently reported that respiration appears to be essential to the growth of plants, perhaps in order to convert nitrate into a usable form, nitrogen. So when we talk about tropical forests as a sink for CO2, we're really saying that they absorb more CO2 than they emit. But under what conditions might this balance change? Debra Clark spoke to us one night about her research on long term tree growth at our host site, the La Selva Biological Station. It was a fascinating and rather disturbing talk where she emphasized the preliminary and unconfirmed nature of her findings ("Hubris, man!" was her call to scientists and politicians alike). Results from the TREES project show slower growth in years with higher temperature and decreased rainfall and that in the same time periods forests may have been overall sources, not sinks, of CO2. With increased warming and drought forecasted for the tropics, the result is that forests may actually contribute to climate change in a positive feedback cycle. At risk of sounding like Debbie Downer, the feedback cycle could be further exacerbated by increased fire and tree mortality. Again, Clark's findings are highly preliminary, but we can say that the role of tropical forests in offsetting anthropogenic emissions is unclear. Based on what we do understand, the conservative course of action is clear: get moving! Change our priorities and create the economic incentives sufficient to end deforestation and dramatically curtail fossil fuel emissions. Sorry for being such a slacker and not checking your blog out over the summer!